Well, this post was originally going to be about how they’re shutting down power to our buildings for the next several days and I wouldn’t even be near the desk. HOWEVER, they moved that power outage back a week (again). Today, though, is probably a very short-standing day. I didn’t get in to work til 10 due to heinous traffic (left normally, sat on the freeway for 40 mins before moving one mile, exited freeway and went home for a couple hours) and I’m going to be up on upper campus most of the afternoon for some work committee meeting things. All I have to say about the desk today, then, is that my feet don’t seem to be getting as tired as they were initially, and my right leg hasn’t been achy. We’ll see how things go tomorrow! 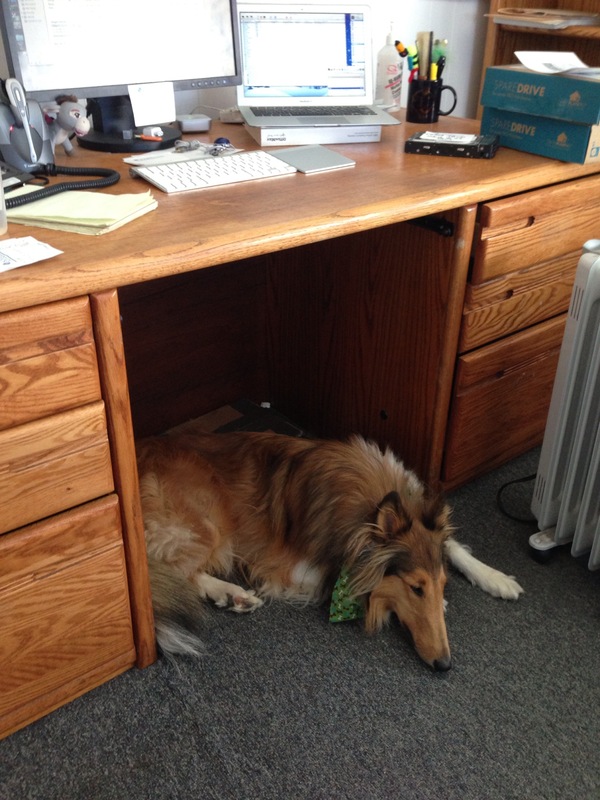 11:42 A: Been running around most of the morning, but am back at my desk just before lunch. I filled up one of the fabric with Penny’s food, treats, and other misc things. I still haven’t figured out what I want to put in the other bin. I think I need more–maybe one for workout clothes, one for spare set of clothes, and the third for misc junk. Oooh, I should get a hook. I could hang my purse on it! 11:46 A: Also, we moved all the old desks outside yesterday afternoon in preparation for surplus (hopefully) coming. I’ve named it DeskJam 2013. 2:18 P: Back at the desk, for hopefully the rest of the afternoon. I’ve already done 8700 steps today, which is pretty high for me this early in the day. I’ve been on my feet and moving around a lot and my feet are tired already. 3:40 P: I reached a breaking point around 3:30 wherein I could no longer stand still without moving around or shifting my weight every few seconds. I sat down on the couch. Harrumph. 8:42 A: Not much to report, other than my secondary (laptop) screen seems incredibly tiny. I spent a lot of time sitting this weekend at the SD RailsBridge conference, and my feet thanked me for that. 10:10 A: My heels are kind of achey already. The mats I ordered last week are on backorder (of course they are). Got my new drawers assembled and put stuff in it, but I haven’t gotten the cable organizer installed yet. I can’t stand the spaghetti of cables hanging down at the moment. The old desk had a solid back, so you couldn’t see anything behind it (or get anything when it fell down, cue me lying on the desk reaching for the dropped cables). 11:14 A: One hunt for the drill, one hunt for the drill bit, and a bunch of wiggling later, and now we are cably-managed. Off to the far right, you can also see the white drawers I picked up from Ikea. 1:10 P: Back from tasty garlic for lunch. My head is being kind of migrainey, so I’m not sure how long I’ll last standing the rest of the day. 5:20 P: Well, my head was unhappy the rest of the day and I blobbed on the couch for the afternoon. Then we moved our old desks outside for pickup tomorrow (don’t steal them). So, I basically didn’t stand at all the rest of the day. 7:32 A: Ok, my right leg, which has the extra blood vessels near the ankle, is very…achey? this morning. Feet feel fine, but I have on my rain boots instead of my normal Merrell Barefoot, uh, well, I’d link them here, but apparently they don’t make that style anymore. It’s like a work sneaker made of leather. 9:10 A: Sat down for a bit to work on some stuff at a meeting. Back up now, but heading down the hill in a bit to work on a computer. Jerry gave me an old box that’s about 6″ tall to prop my right leg up on, just to take some of the weight off it. I also ordered anti-fatigue mats for everyone. 9:28 A: I can’t tell if I have to go to the bathroom more often because I’m standing or because I’m standing, it’s easier to just walk over there. 2:56 P: Well, I was down the hill sitting for a couple hours, and then we went to Ikea to get drawers for the new desk and I’m just getting back now. My feet are so hot that I took my boots off and now I feel short in relation to my desk. 3:54 P: Time to go. Didn’t spend a lot of time at my desk today. Ever since we moved up the hill to our current building/shack/lean-to, we’ve all had these VERY SOLID oak desks that predate computers. They were in the building before us. We had various configurations–there were a couple L shapes, several just straight desks, one small one, etc. My favorite feature was that someone had drilled holes into the tops for cable management–but drilled them IN to the drawers. Very useful. My desk was a behemoth. It had two giant banks of drawers on either side and one tiny cubbyhole that Penny was always trying to co-opt as her cave. It was just big enough for my legs. I just spent an inordinate amount of time looking for the picture where we did a fire drill and I tried to get “under” my desk in a crazy pretzel formation and didn’t fit. At all. Anyways. 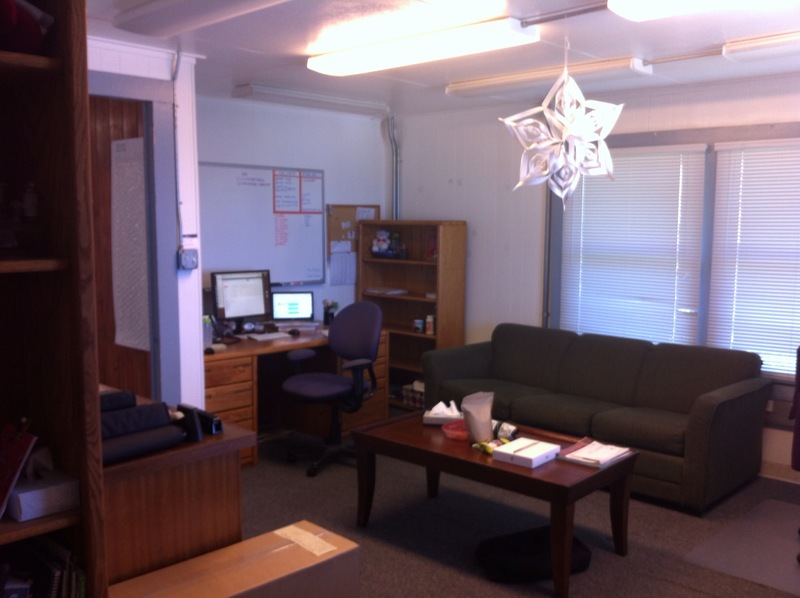 Here is a wideshot of my side of the office after we reorganized it sometime last year. And here is Penny trying to co-opt my cave. Sometime last fall, we took some ergonomic surveys, and then had an ergonomic evaluator come out and …evaluate? You have to do this for UCSD’s ergo program to pay for some of your new equipment. In January, we visited the showroom where they had desks and gear on display. And then, it actually happened. We actually ordered new desks! so, so many pads of paper and pens and pencils. untold amounts of paper I had squirreled away, including my last 3 merit raise notices from 2006, 2007, 2008. Yeah, back when the university had some money. It’s actually a few inches longer than my old desk, so I have more work space (which I am entirely not using). But I was, however, able to move everything over to the left, which is less glary and gives me a nice space on the right to work on other computers. Plus, I can see my corkboard, yay! 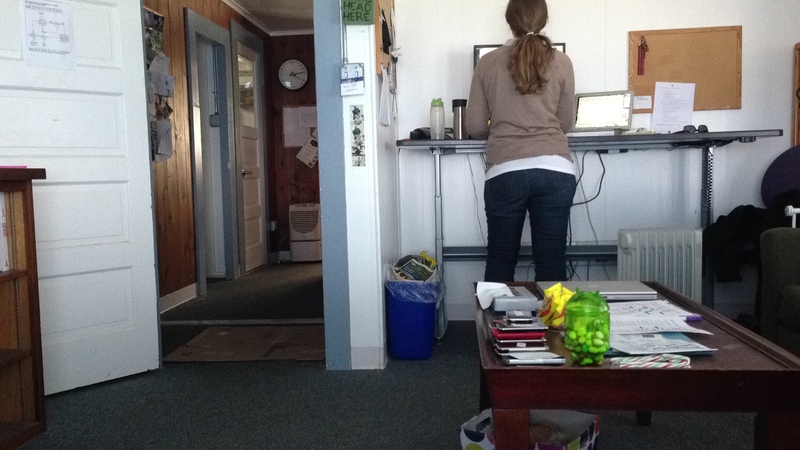 7:40 A: We have arrived at work, the dog has inspected the new desks. I’m feeling good, but the wiggliness of my monitor is annoying. The building is so severely slanted (as much as 2″ drop in 5 feet) that it was impossible to level the new desks perfectly. 8:08 A: I’ve sat down twice–once to play fetch with Penny and once to coerce her with treats until the custodian left. 8:23 A: My heels hurt. 8:58 A: Caught myself with my left elbow on the desk, slouching to the side. Feet are doing ok? A mat would be nice. I scorn my chair. 9:29 A: I remember when I worked at Disneyland, and my legs would be EXHAUSTED after standing all day. And I remember being super envious of the pregnant cast member who got to lean against a stool. 9:33 A: Sat on the couch for a minute. My feet are tingly. 1:32 P: Back from dr. appt, walking up the hill (no parking), walking down the hill, lunch, and back. Standing! 2:00 P: Feet hurt. Right leg is kinda achey. Co-worker is sitting down. 3:21 P: Been shifting my weight a lot back and forth. Heels hurt. I find myself leaning forward against the desk so my weight is off my heels. The dog does not care. 3:37 P: MUST SIT DOWN. So I called the doctor’s office to encourage them to approve it asap and got the standard “It’s a 72 hour turn around time.” Well, that’s great and all, but that puts us AT Friday, and then the prescription still isn’t even filled yet. Which is why I called on a Tuesday for a seemingly simple refill. I’ve stuck with UCSD’s pharmacies so long because they charge you for 2 months and give you 3 months’ worth. That’s pretty nice. But, we literally have to do this every time it needs a manual refill. One time, it took nearly two weeks for the doctor to get around to filling it. Argh, so frustrating!